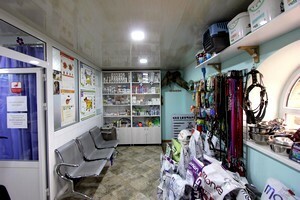 There is a pet shop at clinic, which offers a wide range of products for pets and veterinary pharmacy. In our store you can buy daily wet and dry food for dogs and cats, high quality dietary and medical food, delicacies, care products, houses, pet carrier, collars and leads, clothing, dishes, toys, etc. The assortment of our veterinary pharmacy includes veterinary medicines, vitamin and mineral supplements, veterinary preparations that are used as a treatment of various diseases and needed during rehabilitation period. You can purchase directly from our store at clinic or by calling 096209966 and ordering the right product and also by ordering online from the store at clinic CATALOG on our website. To order the product you have to click on the Contact Seller, fill in your details, enter requested quantity and confirm the order. Your order will be delivered within 24 hours.